Controls Borers and Bark Beetles, nuisance pests in outdoor areas, subterranean termites and carpenter ants. See label for complete list of insects. 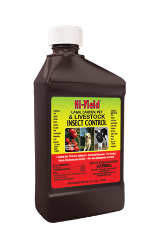 Can also be used on dogs for control of flea and ticks, poultry for control of lice, and livestock for control of flies, mosquitoes, and lice.